Dinner parties are a fairly common occasion at my house, in fact we generally entertain guests once or twice a month. A three to five course meal is not uncommon. This amount of work, generally needs a certain amount of harmony when preparing, a low commitment first plate like cheese and charcuterie (the french word generally used for dried/cured/preserved meat) are a favorite first course of mine. Charcuterie can be made well ahead of time, and cheese generally keeps well in the refrigerator, so it's not difficult or time consuming to put a plate together. I always include pickles on my cheese and charcuterie plates because of the acidity of pickles, they create a wonderful contrast between the savoriness of meat and cheese. Due to this I constantly have a pickle of some sort sitting in the back of my fridge or fermenting on the counter. Pickles in the modern western world are commonly associated with cucumbers. Pickling has a much more significant historical and culturally relevant role than the humble kosher dill tucked in between a pastrami sandwich. Japanese tsukemono, European sauerkraut, and Korean kimchi are all pickles with distinct traditions and important histories. In fact, kimchi was recently added to the UNESCO Intangible Cultural Heritage of Humanity List(Mayring)! Even though modern pickles are primarily considered as condiments, many cultures have been reliant on pickles as a means of survival. Pickling gave many civilizations a way to make the summer and fall's produce last throughout the winter especially in temperate climates (97, Katz). Pickles have been a means of food preservation or thousands of years, the exact origin of the pickle is uncertain, but evidence of the Mesopotamians pickling cucumber can be traced back to between 2400-2030 B.C.E (Avey). Pickling is the technique of submerging foodstuff in an acidic environment where harmful bacteria can not survive. Acid occurs in nature, both in flora and fauna, but the most common means of producing a pickle solution was fermentation. Fermentation in the case of pickles is the process of allowing beneficial lactic acid creating bacteria thrive on food which is submerged in a brine. Early civilizations relied on the growth of these helpful bacteria which produce lactic acid as a byproduct of living and multiplying, the growth of lactic acid bacteria made contained environments such as a crock or jar an acidic enough environment which harmful bacteria could not grow. The use of modern day commercial vinegars, which are already fermented, make pickling faster and more convenient than more traditional forms (lacto-bacteria) of pickling. Pickled eggs may bring up images of a biker dive bar, but I think that they are really fun. I specifically wanted to use quail eggs in this recipe, where in many parts of the world they are considered a delicacy. Truthfully, I used them in this recipe due to their size, they are bite sized, so whether used as a Hors d'oeuvre, Amuse-bouche, or placed on a charcuterie plate, the quail egg gives this pickle a certain degree of sophistication. 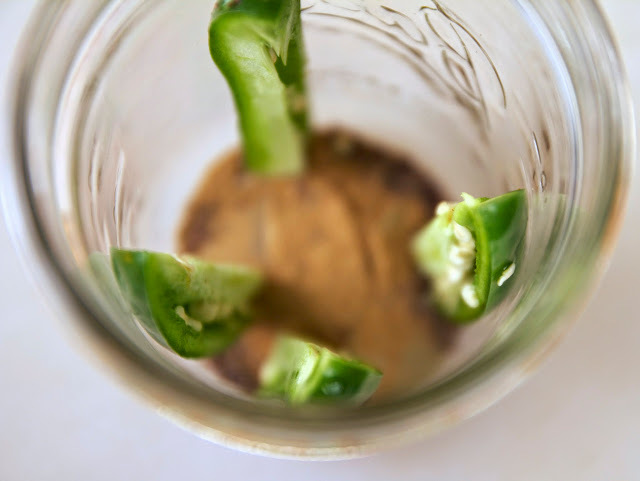 There are many different flavoring and preservation ingredients which may enhance a pickle, overtime flavors meld and become an extraordinary experience. I wanted to use Bourbon primarily as a flavoring agent in the solution because it is sweet and savory. Bourbon is my spirit of choice, and is also uniquely designated near the region of the United States where I live. Bourbon is a whiskey made from 70-80% maize, 10-15% malted barley, and either rye or wheat in the remainder of the mash. Bourbon's sweet vanilla notes come from aging in charred oak barrels. This is a particularly impactful process on bourbon's flavor profile because no artificial colors, sweeteners, or flavors may be added to Bourbon, the only additive allowed is water (McGee 768). In addition to serving this as an element on a meat and cheese plate, I also deviled the eggs and composed a simple salad of dried figs and fresh mozzerella. I wanted to demonstrate the versatility of pickling quail eggs, and hopefully encourage you to add a package of quail eggs on your next grocery list. These delicate and savory eggs are certain to impress at the next potluck or dinner party. Storage note: These eggs are best eaten within about 2 weeks, and always keep them stored in the refrigerator. Combine the white vinegar, Bourbon, maple syrup, water, and salt in a small pot. Bring to a boil then turn off the heat. 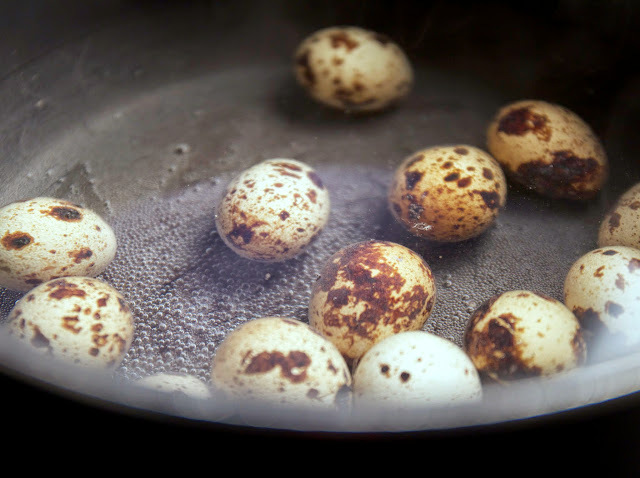 In a separate pot boil all quail eggs for 3 minutes then immediate transfer to an ice bath, let it sit for 15 minutes. Peel the shells under warm running tap water. 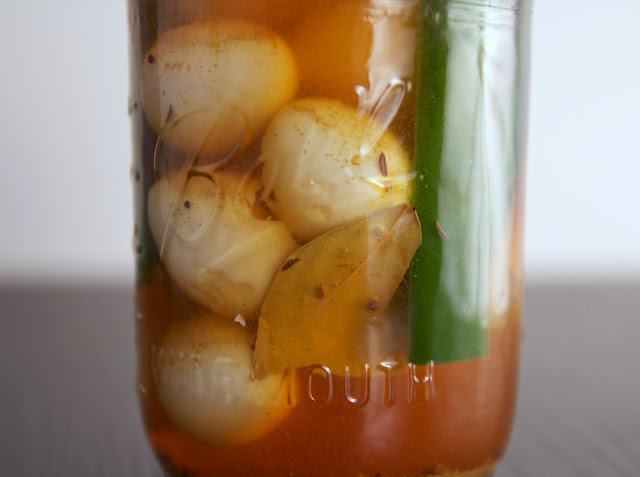 Add the eggs and all the spices into a mason jar, then pour in the liquid pickling brine. Let the jar come to room temperature, then cap and store in the fridge. Wait three days until serving. Avey, Tori. "History in a Jar: The Story of Pickles." The History Kitchen. PBS, 3 Sept. 2014. Web. 1 Feb. 2015. <http://www.pbs.org/food/the-history-kitchen/history-pickles/>. Katz, Sandor E. The Art of Fermentation. White River Junciton: Chelsea Green Publishing, 2012. 97. Print. Mayring, Skye. " Kimchi Tradition Gets UNESCO Designation" January 05, 2014 Travel Age West. N.p., 5 Jan. 2014. Web. 1 Feb. 2015. <http://www.travelagewest.com/News/Kimchi-Tradition-Gets-UNESCO-Designation/#.VM5nLsbZmq4>. McGee, Harold. On Food and Cooking. New York: Scribner, 1984. 768. Print.